Anyone keeping up with the phenomenal releases on 2000Black and Alexander Nut’s Eglo Records will know the trailblazing path that Dego and Kaidi Tatham have forged through nu-jazz, broken beat and boogie on a series of prestigious slabs of wax (here’s our piece on Dego’s ‘Green Woods’ from last year). This Sunday, following last year’s LP on Theo Parrish’s esteemed Sound Signature label, the pair will – finally – make their London debut at Camden’s Jazz Cafe, . Now, we don’t normally write about gigs, but we do like to keep folk who know in the know. And we have it on good authority that this Sunday is set to be a bit special. Expect electronic dancefloor heat cast up from the earthiest of grooves, all flecked with the genre-crossing sensibilities found on their releases on 2000Black. Dego + Kaldi are putting together a four-piece band just for the occasion, running through tracks from their debut LP with – we can guess – a healthy amount of live jams bringing up the sides. Unsurprisingly, you can thank Música Macondo, London-based purveyors of top-notch global sounds, for putting together this bit of magic. 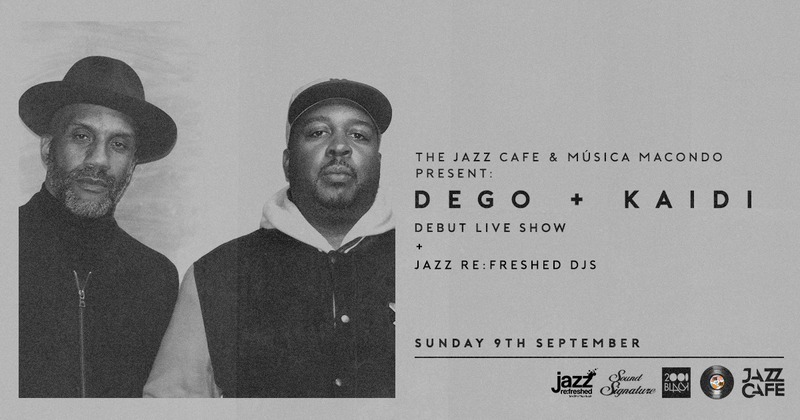 Dego + Kaidi make their live debut this Sunday 9th September. Tickets are available at Resident Advisor.